Recently during a charity event for the Center for Hearing and Communication in a private home, I (chef Jeff Purrazzi) became a believer of the Octoman gospel. The man is as stand up a guy as you could ask for in a chef: honest, passionate, and full of personality. The products he had on display, Spanish octopus and sepia (like cuttlefish or squid), were outstanding. 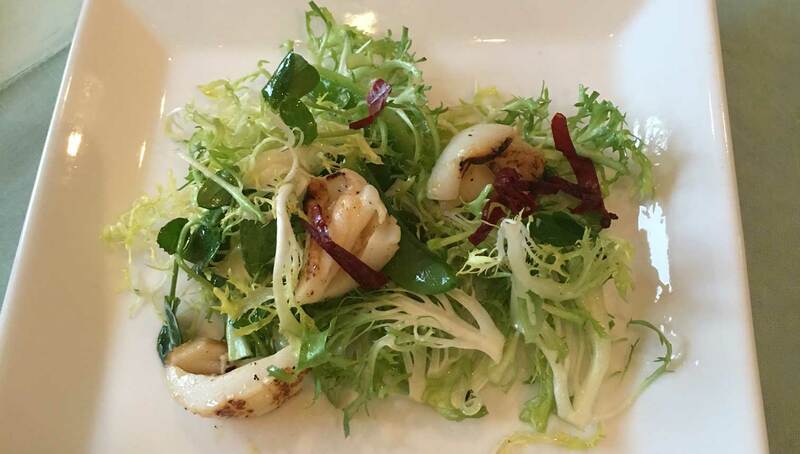 His spin on grilled Spanish Octopus over cauliflower purée -and the grilled sepia salad with yuzu dressing had me convinced I needed to interview him for the blog and get him to join our chef collection! JP: Famous for your namesake, Octopus, is quite a niche market. We’re always intrigued by someone who gets an idea and blows it up! How did you become the octoman? OM: You know what man I fell into or should I say in love with it. I was already an importer fine vinegars and olive oils, so when I met Frank Gullo and tried his products, I mean not all at once -but the octoman you could say was born! JP: Who came up with the special way your company tenderises and brines the octopus you import? JP: What else do you Import and from where? OM: Octopus and Sepia from Spain, Squid from Rhode Island, and amazing finishing vinegars from Modena, Italy. JP: There are a lot of different recipes and techniques to cook octopus, would you say there are any NO NO’s when cooking octopus? OM: Well definitely don’t overcook it! The skin comes off and it loses its amazing texture… That’s why we say our octo is a no brainer as it requires half the cook time and now we even offer legs that have been pre cooked, vacuum sealed, frozen and and once thawed, which takes 15-20mins in the fridge, are ready for the grill! JP: I know Octopus is cooked universally and you’ve done events all over the country. Can you tell me about one of your most interesting events? OM: Heritage Fire in Snowmass, CO -put on by the people at Cochon 555. I did it last year and they asked me back again this year. Its 40 chefs all cooking whole heritage animals. I was in the seafood squad where we slow smoked and roasted a 12# octopus. JP: Where do we go to purchase your octopus? OM: We are now in the 200 wholefoods Boston – NJ/ Northern California/ Rocky Mountain regions, or contact me through Gulloseafood.com and if you meet delivery requirements we’ll deliver to you. JP: How can we get you to work an event or a party in the Hamptons or anywhere your services are needed? At least until you join the chef collection…. JP: Can you share your favorite recipe for octopus with us? 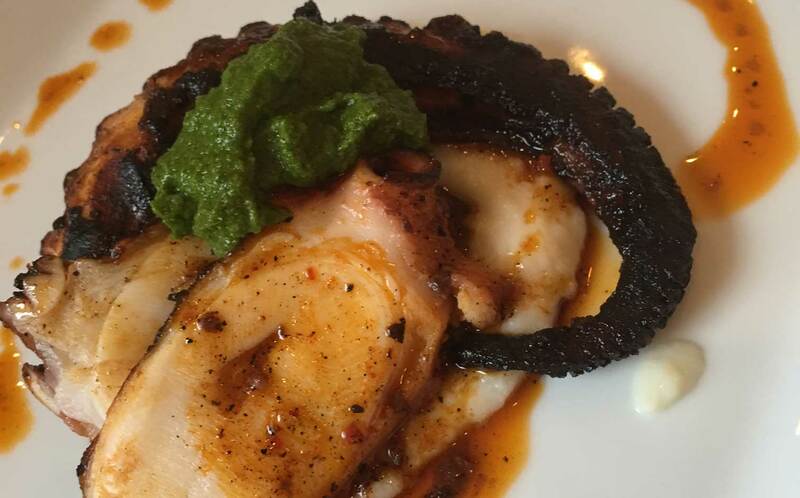 Maybe this amazing grilled octopus that you made tonight…. OM: Of course, we have here my smoked paprika, marinated grilled octopus, served over a simple creamy cauliflower purée topped with a nice fresh salsa verde. Boil a 4lb octopus for around 30 mins, then cool in marinate until needed. A pinch of your favorite chilli flake or powder works wonders. Mix all ingredients in a bowl and reserve until needed. Marinate octo legs. 1 cup / ½ &½ or heavy cream (optional). Add to a food processor in batches, blend until all ingredients are smooth. Hold warm in pot on stove. 2 bunches parsley picked and cleaned. I bunch cilantro picked and cleaned. In a blender purée all ingredients until smooth. Put two spoonfuls of cauliflower purée on the plate, on top put the charred octo legs and drizzle some marinate over them. Finally, hit the top with a bit of the salsa verde and enjoy!